Shrek the Musical came to Theatre under the Stars at Stanley Park Aug 4, 2014 so of course we needed to see it as a family. There was awful traffic getting to the show so we arrived after it started. When we went to take a photo in front of the stage at intermission we had a huge queue of guests wanting photos with us too. 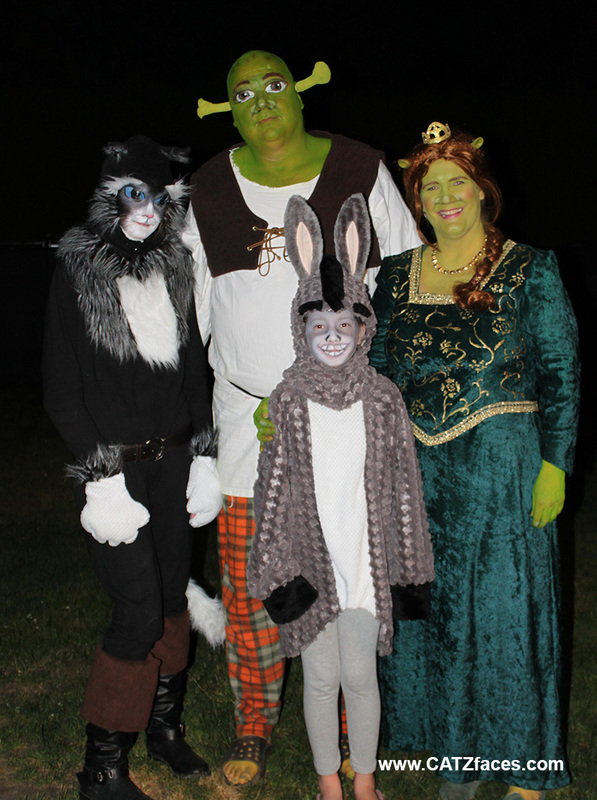 I had made the Shrek and Fiona costumes several years ago, but Kitty Soft Paws and Donkey were created for this event. 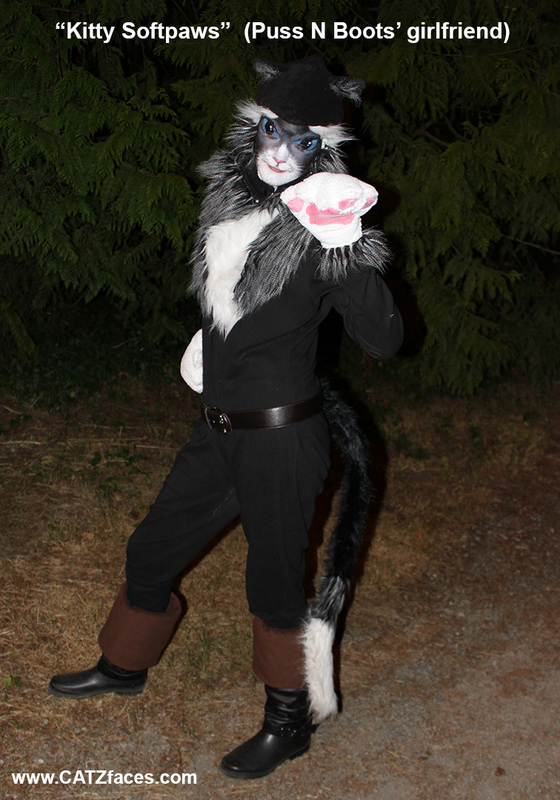 For Kitty Soft Paws, I used a bodysuit I wore back in the 80’s but was still good for my 12 year old 6′ daughter. I made a hat with fur trim and a fur ruff, tail and paws. Since her feet are size 11 feet are a little big and probably would be expensive for pirate boots, I just made a fleece cuff to add to boots she already had. Donkey is a reluctant cosplayer, so I made sure her costume was very comfortable. It is a jacket (zips in back) and she could where her own fleece pants. The hat incorporated purchased ears I had on hand already. I just left slits at the top of the same pattern I used for Kitty so the ears could fit through. Since the ears were a headband, they stayed upright nicely. Looking forward to the next excuse to dress up again. Next time I hope we can have costumes for the cat (Lord Farquaad) and dog (Dragon) too! Copyright © 2017 CATZfaces - Theme by Theme20 & Silviu Andrei.